A bottle of SPF 1000 sunscreen materializes in the dermatologist’s hand. “You’ll need that where you’re going,” God says. The scene is part of a training video for tanning salon employees made by the International Smart Tan Network, an industry group. The tone is tongue-in-cheek, but it’s part of a defiant campaign to defend the $4.9 billion industry against mounting evidence of its questionable business practices and the harm caused by tanning. And, in an extraordinary touch, it is portraying doctors and other health authorities as the true villains — trying to counter a broad consensus among medical authorities that sunbed use increases the risk of skin cancers including melanoma, the most lethal form. The industry has also gone on the offensive using tactics that appear cribbed from Big Tobacco’s playbook to undermine scientific research and fund advocacy groups that serve the industry’s interests. At the heart of the industry’s message is the idea that tanning’s critics such as dermatologists, sunscreen manufacturers and even charities like the American Cancer Society are part of a profit-driven conspiracy. These critics are described as a “Sun Scare industry” that aims to frighten the public into avoiding all exposure to UV light. The tanning industry blames this group for causing what it calls a deadly epidemic of vitamin D deficiency, and tries to position itself as a more trustworthy source of information on tanning’s health effects. What tanning’s proponents rarely point out is that the notion of a vitamin D epidemic is disputed, and even if you need more of the vitamin, you can safely and easily get vitamin D from dietary supplements and certain foods. Even as they themselves use techniques cigarette companies pioneered, some in the tanning industry compare the Sun Scare group to the tobacco industry. “The Sun Scare people are just like Big Tobacco, lying for money and killing people,” Joseph Levy, executive director of Smart Tan and one of the industry’s most visible leaders, said in the D-Angel video. The indoor tanning industry’s image has taken a beating in recent years. In 2009, the World Health Organization’s International Agency for Research on Cancer designated UV-emitting tanning devices as carcinogenic to humans. Subsequent research supports this conclusion, including a large University of Minnesota study that found indoor tanners have a 74 percent greater risk of developing melanoma, overall, than those who have never used sunbeds. What’s more, it identified a dose-response relationship. That is, the more time you spend in a sunbed, the more likely you are to develop melanoma. The notoriety of the so-called Tanning Mom – the leathery-faced New Jersey mother charged with child endangerment after allegedly bringing her redheaded kindergartner into a tanning bed – certainly didn’t help the cause. The American Academy of Pediatrics and American Academy of Dermatology urge minors not to use sunbeds. But teens, more worried about looks than health risks, are an important part of the industry’s clientele, and salons cater to minors with Back-to-School sales and prom specials. California and Vermont prohibit youths under 18 from tanning indoors, and New York this month imposed a ban for those under 17. Thirty-three states regulate teen tanning to a lesser extent, according to the research firm IBISWorld. Meanwhile, the Federal Trade Commission and Texas Attorney General have attempted to rein in marketing messages they say misrepresent the risks of tanning. The Texas lawsuit is pending, but the FTC reached a settlement with the industry’s largest trade group, the Indoor Tanning Association, in 2010. Still, misleading messages continue to be the norm, Democrats on the House Energy and Commerce Committee reported in February. Posing as fair-skinned teenagers, undercover investigators phoned 300 salons nationwide and found 90 percent of employees they spoke with said tanning did not pose a health risk. What’s more, 51 percent denied that sunbeds increase cancer risk. Industry groups say the questions were posed in a leading way and that investigators would have been more fully informed of risks had they visited salons in person. Despite the bad press, the indoor tanning industry is holding steady. It showed slow but continued growth over the last three years, and revenues are expected to edge up to $5 billion by 2017, according to an IBISWorld analysis. White women ages 18-21 are the leading customers, the Centers for Disease Control and Prevention reported in May. Nationally, 32 percent of women in the group visited tanning salons in 2010, including 44 percent in the Midwest. In all, every year an estimated 28 million Americans tan indoors. At an age when most people feel invincible, 25-year-old Chelsea Price is living life in three-month increments. 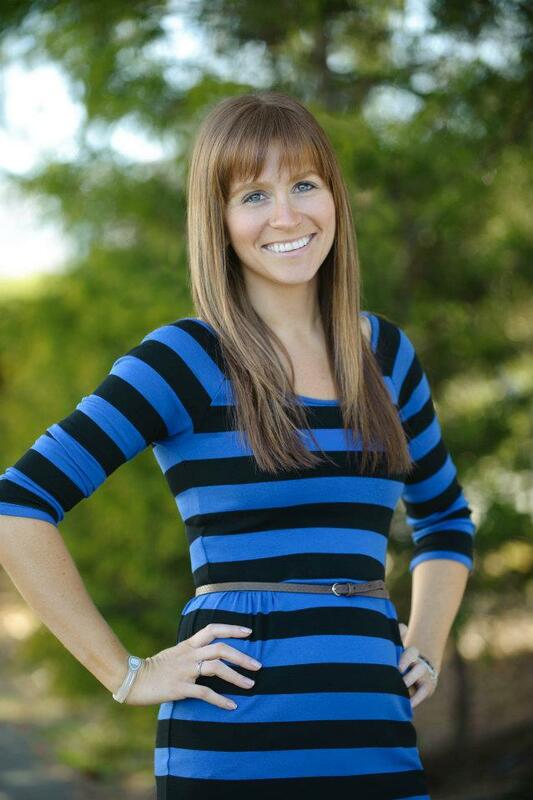 In January 2011, she was diagnosed with Stage III malignant melanoma that had spread to several lymph nodes. 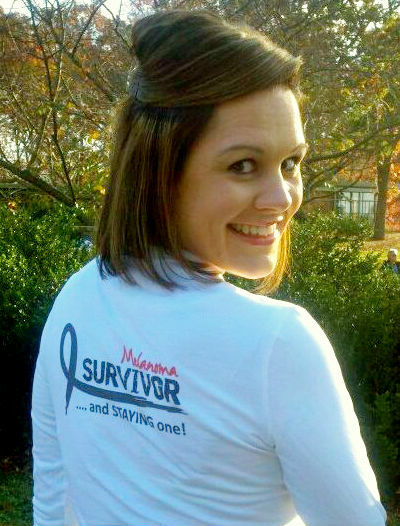 Chelsea Price of Roanoke, Va., a former tanning salon patron, was diagnosed with Stage III malignant melanoma in 2011. Price’s first reaction was giggles. Her doctor was a kidder and had seemed unconcerned about the mole he’d removed, even reassuring her that he was doing it just to be safe. “I wish I was joking,” he said when he delivered the news. After two invasive surgeries on five parts of her body, Price shows no sign of melanoma today. But Stage III melanoma is an aggressive cancer with a high rate of recurrence, so Price goes to doctors every three months for a skin check, CT scan and blood tests to make sure she’s still cancer-free. She is also taking part in an immunotherapy clinical trial, so every three months she travels from her Roanoke, Va., home to the Memorial Sloan-Kettering Cancer Center in New York City. She never knows how she’ll feel after a treatment or if a scan will turn up trouble. “It dictates my life,” Price said. Like many melanoma patients, Price is young, female and a former tanning salon user, though it’s impossible to say with certainty whether the time she spent in sunbeds caused her illness. What started at age 14 as a way to look good for a school dance eventually became part of Price’s preparations for special occasions and a way to bond with her sorority sisters. Yet Price was no tanning addict; she used sunbeds only for a couple of months each year and she never burned. “Despite not having a family history and not getting any bad sunburns, here I am. I am the person who did it safely and in moderation, but yet I’m here,” Price said. Price is hardly alone. Skin cancer is the most common cancer in the U.S. and diagnoses of melanoma, though still rare, have increased steeply over the last 40 years. Melanoma among white women ages 15-39 has shown a particularly striking rise, up 50 percent from 1980 to 2004, according to the National Cancer Institute. The typical melanoma patient has changed over a generation, says Dr. Bruce Brod, clinical associate professor of dermatology at the University of Pennsylvania in Philadelphia. When he started out 20 years ago, Brod’s typical melanoma patient was a middle-aged male who’d gotten too much sun over the years. Today, most of the people he treats for the cancer are young women. “The patient demographic for melanoma has really shifted and I think that’s thanks to the tanning salons,” Brod said. In 2008, the Indoor Tanning Association fired the first shot in the industry’s battle to defend itself against its critics, with a full-page ad in The New York Times. In block letters it read, “Tanning Causes Melanoma.” The word “HYPE” was stamped over the statement. Smaller print read, “There is no compelling evidence that tanning causes melanoma. Scientists have proven, however, that exposure to all forms of ultraviolet light – both indoors and out – stimulates the natural production of vitamin D.” The ad went on to claim that the vitamin protects against heart disease and many cancers. Similar statements also were made in television commercials. In 2008 the Indoor Tanning Association launched an ad campaign downplaying indoor tanning's health risks. The ad campaign was designed by Richard Berman, the Washington lobbyist and public relations executive. His work to defend the alcohol industry, and attack unions and groups like Mothers Against Drunk Driving, has earned him the nickname “Dr. Evil” among his critics. Health groups saw this campaign as further evidence of both his and the tanning industry’s mendacity, and the FTC accused the association of making false claims about sunbed use. “The messages promoted by the indoor tanning industry fly in the face of scientific evidence,” said David Vladeck, director of the FTC’s Bureau of Consumer Protection in a 2010 statement. The tanning association and the FTC reached a settlement in 2010 that included no fines, but barred the tanning association from making misleading statements, misrepresenting tests or studies or making any unfounded health claims. Under the agreement, the tanning association must “clearly and conspicuously” display a notice stating the risks of indoor tanning and, when making statements about the health benefits of vitamin D, state that consumers do not have to become tan to get it. Asked if the tanning association is in compliance with the FTC settlement, Janet Evans, a senior attorney at the commission who handled the tanning association case, declined to comment. The tanning association has not mounted another large public relations campaign since 2008. Instead, it directs most of its resources toward lobbying. The association had 37 registered lobbyists in 16 states in 2011, according to National Institute on Money in State Politics data. Vitamin D claims are also at the center of the Texas Attorney General’s case against Darque Tan, a chain with more than 100 salons nationwide. It is charged with illegally claiming in advertising materials that use of its tanning devices reduces the risk of cancer and provides other health benefits. The attorney general is seeking an injunction that would halt the allegedly misleading ads as well as unspecified monetary penalties. The industry champions the work of a handful of physicians and self-styled health experts who promote the idea that Americans suffer from an epidemic of vitamin D deficiency, which puts them at risk for serious health problems. The body creates the so-called sunshine vitamin in response to sunlight, and many in the indoor tanning industry promote sunbeds as a surrogate for natural light. In doing so, the industry shifts the debate from indoor tanning’s health risks to more favorable turf – its potential health benefits. This strategy echoes the tobacco industry’s early attempts to promote its products as healthy, said David Jones, a dermatologist in Newton, Mass., who co-authored a 2010 paper comparing the marketing tactics of the tobacco and indoor tanning industries. “The tanning industry is doing the same thing,” he said. Vitamin D plays a widely acknowledged role in bone health and immune function, but the prevailing medical opinion is that evidence that vitamin D prevents cancer is inconclusive. The National Cancer Institute says there is evidence that the vitamin may reduce risk of one cancer, colorectal cancer, but even those results are inconsistent. 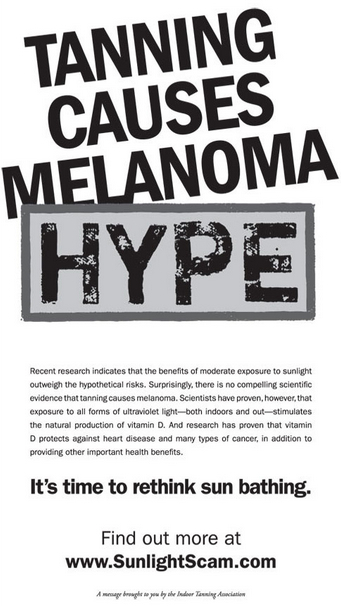 But the tanning industry’s promotional materials present such claims about vitamin D’s health benefits as undisputed facts. Taking a page from the tobacco playbook, the tanning industry attacks the research behind the mainstream medical consensus that indoor tanning increases risk of melanoma and other skin cancers. Tanning advocates insist that the links between UV exposure and melanoma are not well understood. “The dermatology lobby has not represented that relationship accurately,” said Smart Tan’s Levy. But DeAnn Lazovich, a cancer epidemiologist at the University of Minnesota, says the latest research “provides even stronger evidence” that UV light from sunbeds is carcinogenic. Joe Levy, executive director of the International Smart Tan Network, a salon association. He is point man in the industry's campaign to shift the conversation from indoor tanning's health risks to its purported benefits. The industry also takes aim at its critics’ integrity using an approach that Berman has called the “shoot the messenger.” The line “What cigarette do you smoke, doctor?” taken from a vintage television ad claiming more doctors smoked Camels than any other brand, is a refrain in the D-Angel training video. Levy uses this and other ads to portray the medical profession in general as having shilled for the tobacco industry. While the American Medical Association pocketed industry money, and some tobacco companies claimed that doctors endorsed their brands, Levy makes the dubious assertion that the medical profession broadly endorsed smoking as healthful. He contends that physicians continue to endanger public health in the interest of profits. Levy, more specifically, says dermatologists, sunscreen manufacturers and anti-cancer groups spread a “fear based message” that spurs sunscreen sales, sells ads in glossy fashion magazines and sends frightened people to the doctor for skin checks. Asked to defend this statement, Levy provided no direct evidence of a plot. Instead, he referred to a study that suggested if Americans increased their vitamin D levels, nearly 400,000 premature deaths per year could be prevented – about the same number of premature deaths that, federal health authorities said, are caused by tobacco. But Lazovich said the study cited by Levy was based on unclear calculations and “cherry picked” data. Levy, who worked as an investigative business journalist in Michigan before joining the tanning industry, is a pivotal figure in defending the business. 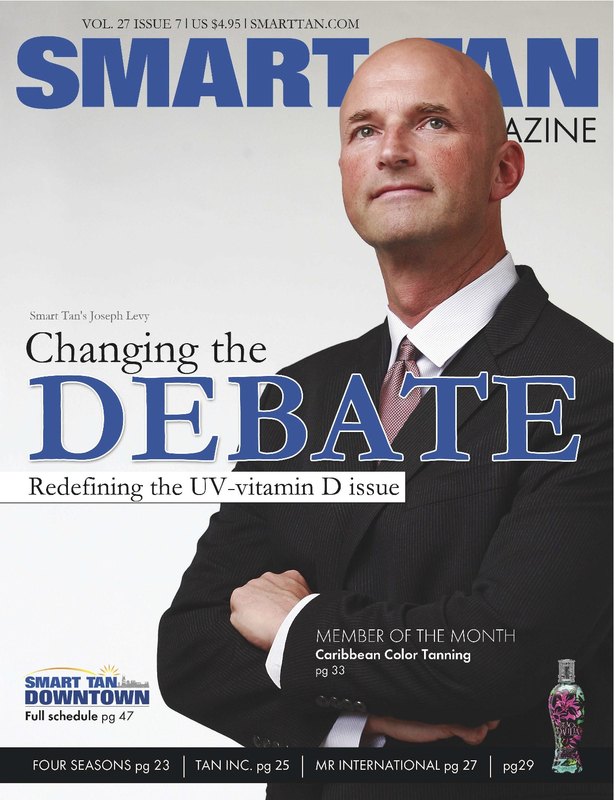 While a vice president at Smart Tan, he also served as an officer of two non-profit vitamin D advocacy groups – The Vitamin D Foundation and the Vitamin D Alliance – and served as the executive director of the Vitamin D Society, a Canadian group. Yet the close ties between the tanning industry and the web of nonprofit groups that promote the health benefits of Vitamin D (PDF) often are not readily apparent. The website for the Vitamin D Foundation, for example, discloses no industry affiliation, though 2010 tax documents reveal that their top personnel were all people in the business. In addition to Levy, they include the CEO of Beach Bum Tanning, a chain with 53 salons, and the president of the Joint Canadian Tanning Association, who also owns a large chain of salons. These groups raise money at salons by selling pledge cards, wrist bands and T-shirts. Then they funnel the funds to vitamin D researchers and organizations that reinforce the industry’s claims about the vitamin’s health benefits, while directly or indirectly promoting the idea that tanning is healthful. One such organization is the Breast Cancer Natural Prevention Foundation, which promotes vitamin D for breast cancer prevention. The founders include Dr. Sandra K. Russell, an obstetrician-gynecologist who appeared in advertisements for Smart Tan wearing her lab coat and a stethoscope. In promoting the health benefits of UV-induced vitamin-D, the tanning industry must tread carefully – after all, health claims were central to the FTC complaint, the Texas Attorney General’s case and the congressional report that blasted the industry. But the FTC cannot police what indoor tanning salon employees say when they are off the clock, and the D-Angel training program takes advantage of that. But the reality for salon employees is more complex, says Lisa Graubard, a 15-year industry veteran who managed three salons on the New Jersey shore. Graubard is not anti-tanning but says salon employees need better training. While she tried to provide accurate information to customers, there was sometimes pressure to downplay tanning’s risks, “There are definitely salons in the industry that are like, ‘We’re not going to use the c-word,’” she said. Meghan Rothschild of Northampton, Mass., was 20 when she was diagnosed with melanoma, the deadliest form of skin cancer. Rothschild speaks to high school and college groups about the dangers of sunbeds. Graubard acknowledged that some of her own customers kept tanning even after they’d developed skin cancer, although employees encouraged them to use sunscreen on the areas where they had growths removed. One man, she recalled, was coming to tan even as he was undergoing melanoma treatment. He would come to the salon with bandages still on his face from surgery.Graubard has since left the industry because years of tanning have caused discoloration on her face. During her time in the industry, Graubard saw her clientele shift from older people to younger girls. By the time she left, teens as young as 14 or 15 were coming in, begging to tan without the legally required parental permission. She’d turn them away, but it was common knowledge that a chain down the street let young teens tan without parental permission. “Consent? It was like a joke,” she said. But today, Rothschild blames a lack of regulation and an industry that she says did not accurately communicate the risks to consumers. Though she signed a postcard-sized waiver at the salon she used, the consent form seemed more about releasing the salon from liability than informing her of potential health problems. Rothschild, who lives in Northampton, Mass., speaks to high school and college groups frequently about the risks of indoor tanning. The choice of whether to use indoor tanning facilities, Rothschild said, should not be left up to youth who don’t understand the risks or have the foresight to think about the consequences. “There’s no reason we should allow kids to do this. We don’t allow them to smoke,” she said. FairWarning (www.fairwarning.org) is a nonprofit, online investigative news organization focused on safety and health issues. This article is published with permission under a Creative Commons license. Tanning Bed photo by Whatsername? via Flickr. How Much Oil From Deepwater Horizon Is Still on Sea Floor?